The Republic of South Africa is vast and diverse in both geography and educational achievement. 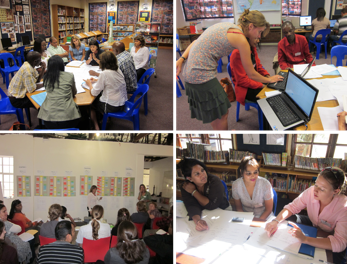 Megan Beckett, Content Coordinator and Project Manager at Siyavula Education, based in Cape Town, has written a great post for us on the role open education has to play there focusing on activity at Siyavula. 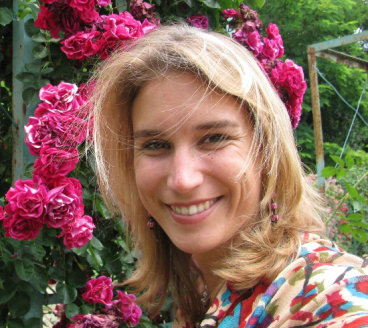 Her passion is to make education accessible and engaging for youth in the developing world, harnessing innovative technologies and open resources to do so. In her role at Siyavula she has coordinated the production of Gr 4-9 OER, which were printed and distributed by the government for the whole country. You can read more on Megan’s blog. 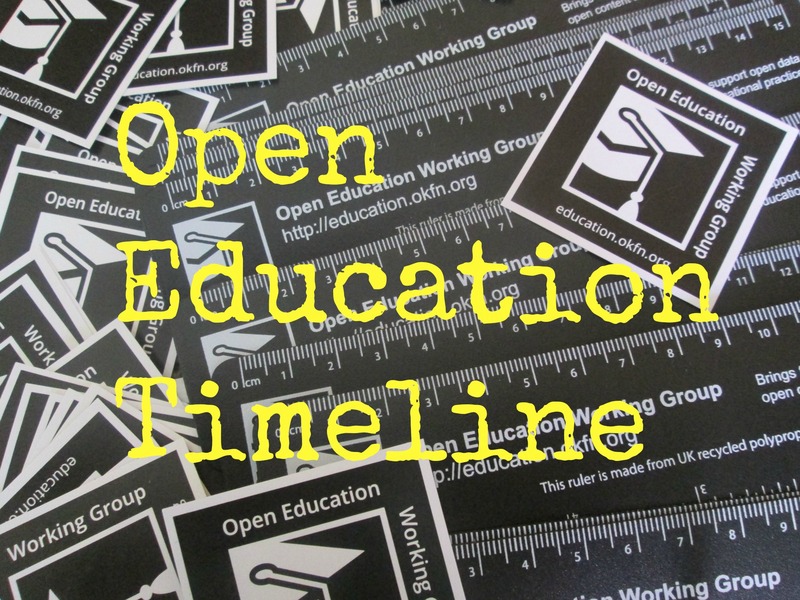 This is the second post on Open Education in South Africa. 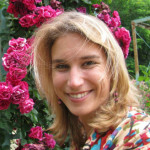 The first was written by Dr Anna Wertlen in January and looked at Village Scribe Association activity. South Africa is a beautiful country. We have much to celebrate and be thankful for, such as our 5th democratic elections since the end of Apartheid, which took place in May this year. But, as most people are acutely aware, both locally and internationally, although our government has one of the highest spends on education in the world, our state of education is in a crisis, and we are failing the majority of our learners, especially in rural areas. 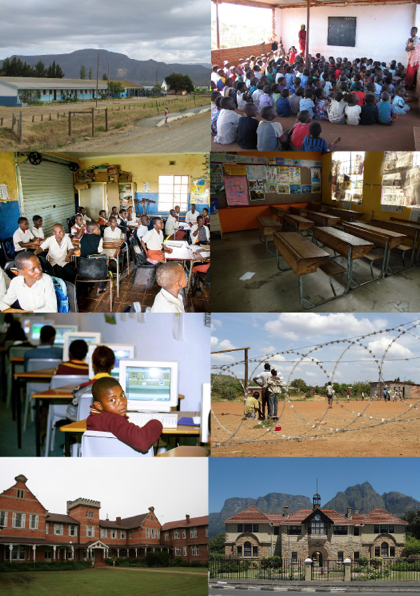 South Africa’s basic education system consists of public and private schools. The public schools are government funded. Each of the 9 provinces in the country are responsible for their schools and as a result, standards vary immensely, depending on the efficiency, accountability and budget of the province. Many public schools, especially in rural areas, are severely under resourced, lack any basic infrastructure such as sanitation, electricity and brick walls. The teachers are under qualified teachers, or often there are no teachers at all. In the bigger cities, public schools are generally of a higher standard. Many middle and high-income families that can afford private education, send their children to private schools, which are independently run from the government. These schools are generally very well equipped and have an internationally recognised reputation. South Africa is a beautifully and poignantly diverse country. It is part of our heritage and defines who we are. As can be seen, the educational contexts in South Africa are no exception and are extremely varied. And yet all schools, learners and educators have their unique challenges. In a country such as ours, it is even more true that there is no one size that fits all. The open education movement embodies the vision and hope for South Africa to embrace our diversity and meet our challenges head on. Firstly, let’s not forget that the Cape Town Open Education Declaration came about from a meeting convened in 2007 in Cape Town. 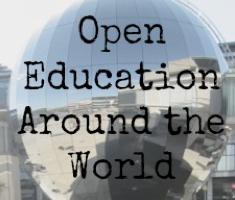 Anyone can sign it as a commitment to further promote, grow and strengthen the open education movement globally. OER Africa, an initiative established by the South African Institute for Distance Education (Saide), aims to build capacity in African education through openness across the continent. The University of Cape Town (see their OpenContent) and the University of the Western Cape (see their Free Courseware) are both part of the Open Education Consortium. (For further reading on the use and production of OER & OCW in teaching in South African higher education institutions, have a look at this case study.) Furthermore, the OpenUCT Initiative aims to support and open up scholarship. The University of South Africa (UNISA) was the world’s first open distance learning institutions and now one of the largest universities in Africa. In May this year, UNISA approved an OER strategy. Find out more at UNISA Open and download the strategy here. The initiatives outlined here are mostly focused on higher education in South Africa. Siyavula is a social enterprise working in basic education (K-12) to make high quality educational resources available to every learner and teacher in South Africa. Our young, dynamic team of 18 people is based in the beautiful mother city of Cape Town. “Siyavula” is an Nguni word meaning “we are opening” and therefore is not only core to our mission to open up education in South africa, but it also means something to the majority of people we are trying to reach. We have built ourselves up on three solid foundations, openness, community and technology, and continue to work at the intersection of these spheres to truly have an impact in South African education. You can read a bit more about our story of how we came to be here. Siyavula’s openly licensed content is primarily focused on Maths and Science for Gr 4-12 and aligned to the national curriculum. It is available in English and Afrikaans, 2 of South Africa’s 11 official languages. Learners receive mother tongue instruction up until the end of Gr 3. In Gr 4, most schools switch to, or continue with, instruction in either English or Afrikaans. By high school, all subjects are taught in either English or Afrikaans. You can find out more about the different textbooks here. Siyavula’s OER is Maths and science focused for Gr 4-12. As a result of the open license on our textbooks, we have established a unique relationship with the Department of Basic Education (DBE). Over the past 2 years, the DBE has extensively reviewed and then endorsed our textbooks for national printing and distribution. So far, about 10 million hardcopy versions of the textbooks have been printed and distributed by the government across South Africa to all public schools. This is a hugely significant achievement. Not only are printed textbooks are extensively used across South Africa, but they are also a necessary form of delivering (educational) content, due to the lack of internet connectivity and high data charges. Many of the schools and learners that received these textbooks were severely under resourced and they had not had access to textbooks before. 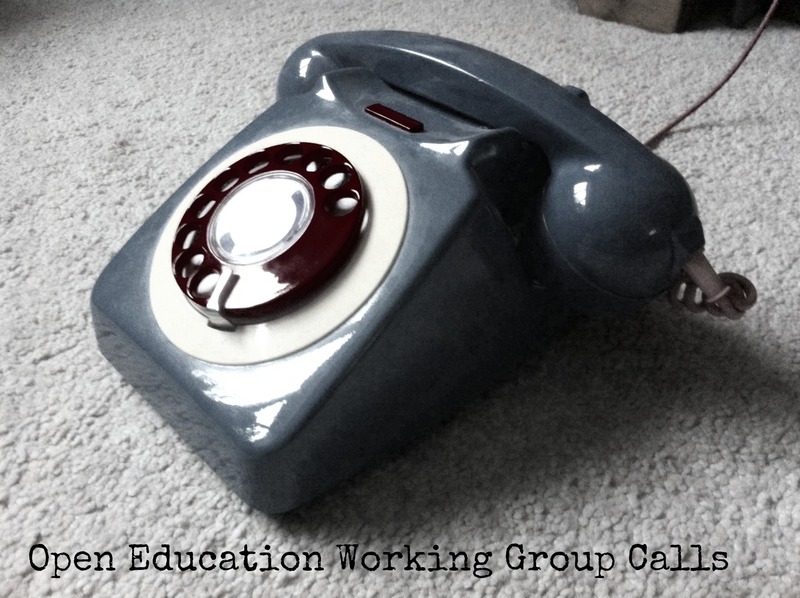 For more insight into distributing OER in the developing read this post. The Siyavula textbooks are available in multiple formats, including print, web, mobile and ePUB. The Gr 10-12 content is also available on Mxit. This is a chatroom service developed in South Africa, similar to Whatsapp, but importantly, it works on low end feature phones. It is therefore especially popular amongst the youth and in rural areas, where smart phones are not yet as prevalent. 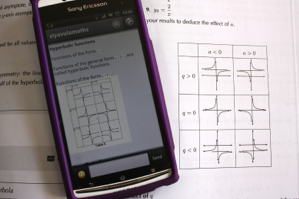 Using Mxit is extremely cheap and therefore allows learners to access content with hardly any data charges. Over 800 000 learners read the content online every month and most of this is over mobile, and through the Mxit channel, highlighting the importance of mobile technology and development in Africa. Increasing access to content through multiple formats which speak directly to our target audience. The implications are that learners now have access to the content they need to study and learn inside and outside of the classroom. This is especially significant as many schools insist on keeping physical textbooks on site to prevent loss and damage. They can also access previous grades for revision, which was never possible with a printed, traditional textbook before. 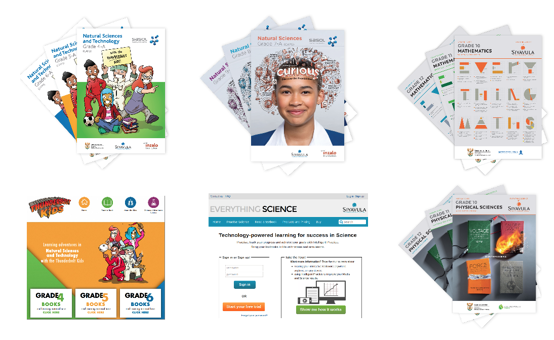 It’s not surprising that we have heard learners refer to our content as “the textbook in their pockets”! The content is further enriched with embedded videos and simulations relevant to the concepts being discussed. These are either used by learners in their own time, or by teachers in their classroom. Besides our open content, we also have a premium, value-added service, Intelligent Practice, available at a subscription to schools and individuals. It is built upon machine learning, allowing learners and educators to make intelligent data driven decisions informed by analytics on performance and mastery of concepts. At Siyavula, community is at the heart of our content development processes, which are open, transparent, iterative and collaborative. We have tried and tested many different models for collaborative development and are coming close to an ideal process that draws on the strengths of the community and feeds into our work. We work with a large group of volunteers and contributors both online and in physical workshops. The volunteers can be educators, post-graduate students, academics, government officials, curriculum advisors, and even some learners! The initial workshop is a chance to unpack the curriculum, discuss and share ideas, brainstorm the best ways to present content and also learn about open licenses and OER. You can read more about one of our volunteer workshops held last year here. Volunteers also contribute online by helping with review, proofreading and translation. A diverse group of people from different contexts and backgrounds ensures our content is more relevant to the needs of South Africa than if it was only produced by a select few. We get absolute scrutiny of the content, often resulting in online debate and discussion, which is open and transparent to anyone. The large number of contributors has been noted as an indicator of quality for educators. Volunteer educators taking part in the processes learn about open education and we have seen they are then more likely to adopt and advocate for the use of OER in their schools and networks. The processes provide a space for people to give back meaningfully to education in south Africa, knowing that their contribution will have an impact. We start to build a community around the open textbook, which facilitates continued revision and updates. Our processes have started to seed other communities of open practice. 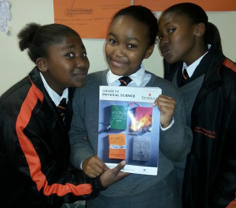 Read more about how a group of educators remixed our science textbook to suit the private schools’ curriculum, here and here. We recognise every single person who contributed in some way by putting their name in the front of the books. 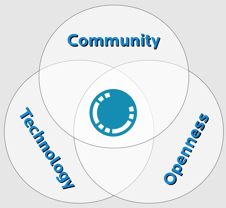 We have also started to award open badges to community members who make a significant contribution in some way. This attribution and recognition of individuals means a lot to those involved and helps to build the community. 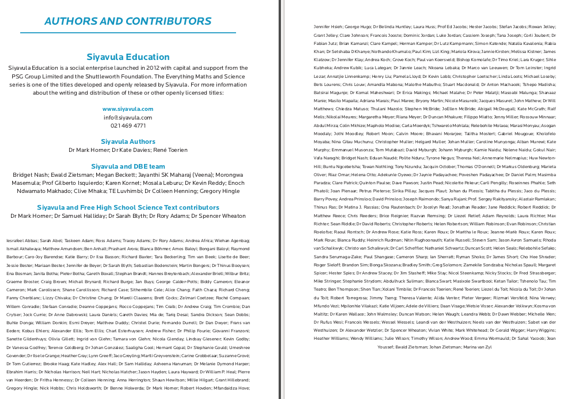 The long list of “Authors and Contributors” for our Gr 10 Physical Sciences textbook consisting of volunteers from around the world. At Siyavula, we have now formalised our relationship with the Department of Basic Education as we pursue a Slate of Open Titles. We have a memorandum of understanding with the DBE that they will review and endorse the content that we produce going forward. We are going to expand our coverage of school subjects over the next 3 years to produce the 40 most crucial textbooks needed for STEM performance in Gr 4-12. This content will be available over web, mobile and Mxit. At the moment, we are currently looking for sponsors and partnerships for each of the books titles, both locally and internationally. An open catalogue of titles, aligned to the curriculum, will open up further opportunities for groups to build upon, adapt and localise the content even more to address the diverse and specific needs of different learners and contexts in South Africa. At Siyavula, we are focused on developing our technology and platforms to support the work that we do and also enable others to easily edit and adapt the raw content online. We are determined to create more awareness of the work we do, locally and internationally. We have started to use our open content to also promote and educate teachers and learners about the open movement, as described here. And lastly, we are focused on being a sustainable, thriving, innovative organisation, harnessing technology and openness to revolutionise education, in South Africa and beyond. As our late Nelson Mandela famously said “Education is the most powerful weapon which you can use to change the world”, and in order to unlock that weapon, we need to open it.